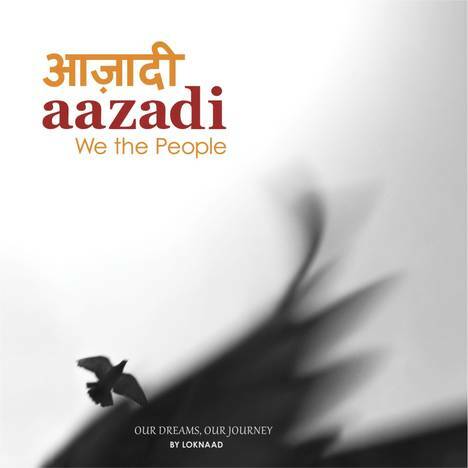 Aazadi - We The People | Loknaad | OK Listen! First of its kind a tri-lingual Album of 10 reflective, inspiring tracks. The album is inspired by several social efforts striving to realise the meaning of ‘aazadi’. Songs are written and composed by Loknaad team based on their field experiences with various communities and interactions with people’s campaigns and movements across the country. An emotional journey of reality around us. 1. Aazadi - Our freedom, our dreams. 2. Chaudah November - Heartrending question by starving children. 3. Kitthe Gaiyyan [Punjabi] - Child labourer searching her vacation. 4. Haathon Ko Kaam - Questions by idle hands. 5. Zero BHK Bungalow [Gujarati] - Story of homeless people through salt makers' home. 6. Baarish Ki Boondein - Dream for dignified ageing. 7. Janane Ka Haq - Questions to our democracy. 8. Sanjhi Virasat - Story of our shared, syncretic heritage. 9. Beta Jaldi Ghar Aana - Never ending hope of a mother living in a conflict zone. Made possible from the interest free loans, contributions and voluntary efforts of many friends of Loknaad like you and me who all cherish the dream of dignified India.